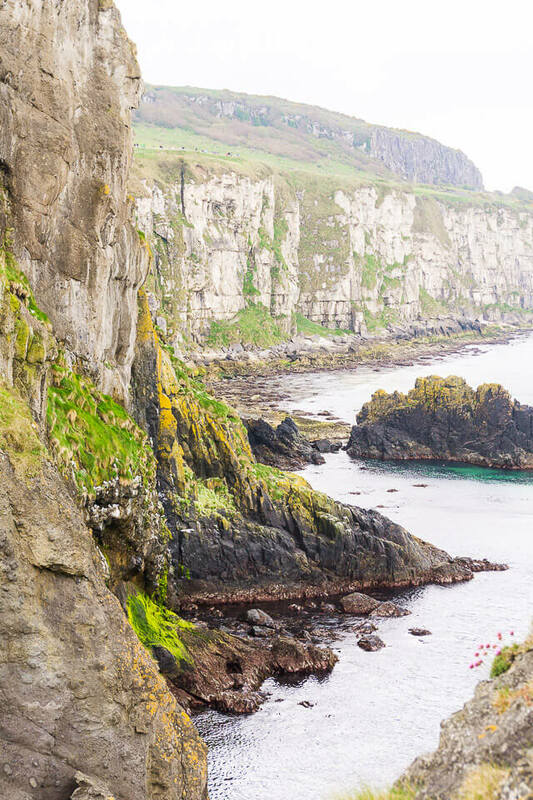 When in the Emerald Isle, venture north for the breathtaking scenery of Northern Ireland. We’ve been back from Scotland and Ireland for over two months now, honestly, it seems like both yesterday and a lifetime ago. Yet still, I find myself dreaming of the turquoise waters, the lush green land, and the clean air of these beautiful countries. 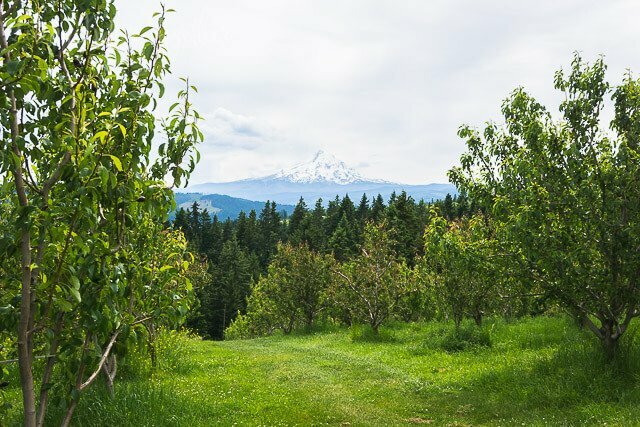 And trust me, by the time you’re done looking at these pictures, you’ll be dreaming too. 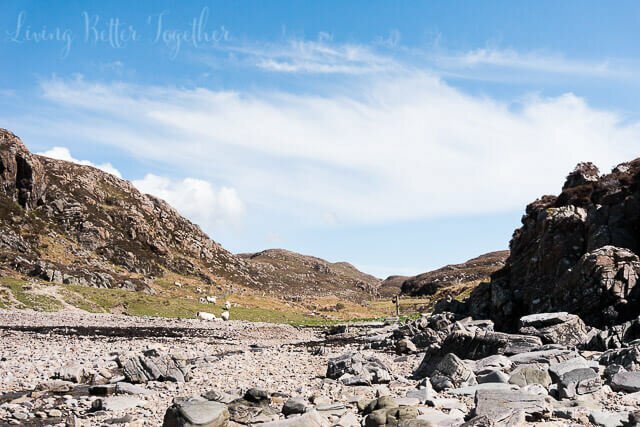 We only had a couple days in Ireland and decided to do a couple tours through Irish Day Tours rather than dealing with the hassle of renting a car. Our tours left early each morning from the Mary Malone Statue, just in front of the stone church on Suffolk Street in Dublin. 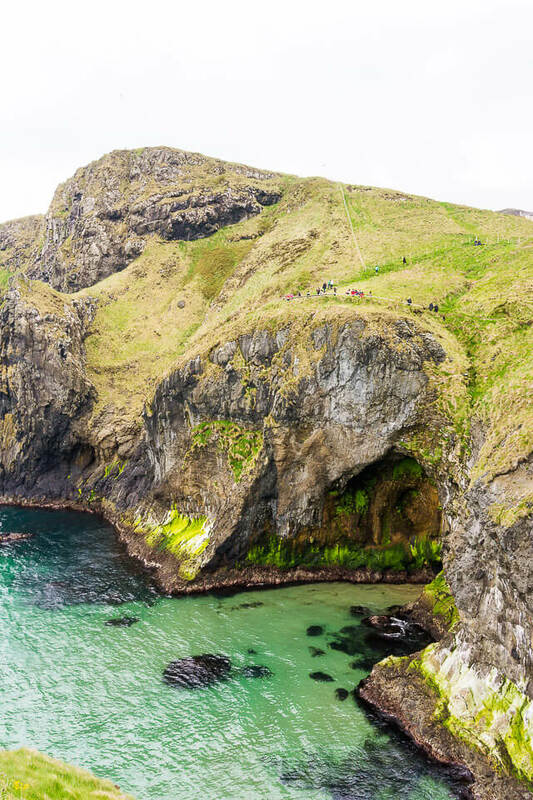 We took a tour to Northern Ireland to see the Carrick-a-Rede Rope Bridge and the Giant’s Causeway. 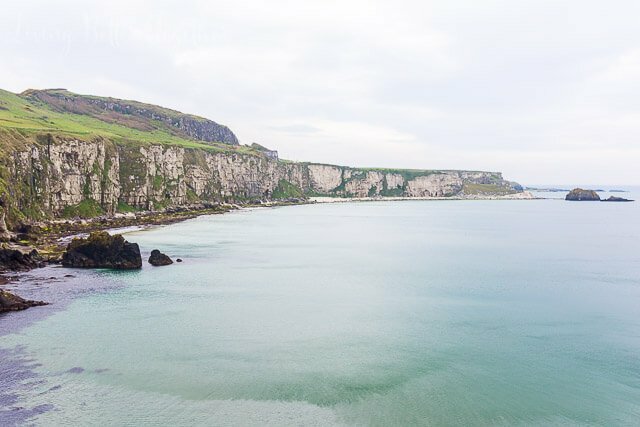 We drove the Causeway Coastal Route from Dublin to Northern Ireland and it made for some beautiful sights. I would recommend sitting on the right side of the bus (driver’s side) if you want a good view. Once we got the to visitor’s center for the bridge, it was about a 20-25 minute walk out to the bridge itself. The bridge was really cool and the area surrounding it was beautiful. 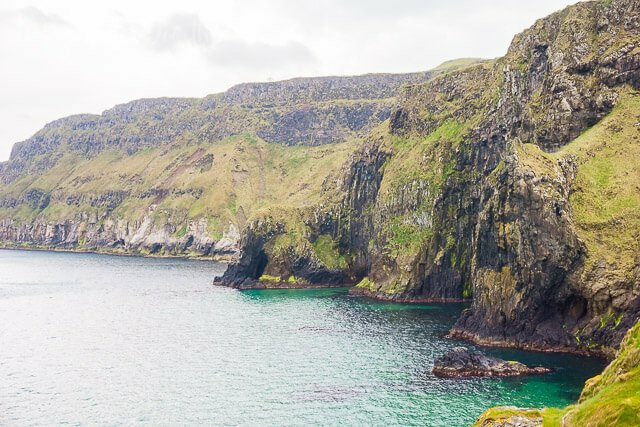 Scenes from Game of Thrones were actually filmed around here. I will say one thing though, when we were planning our trip, photos made the bridge seem a lit higher and longer than it was. 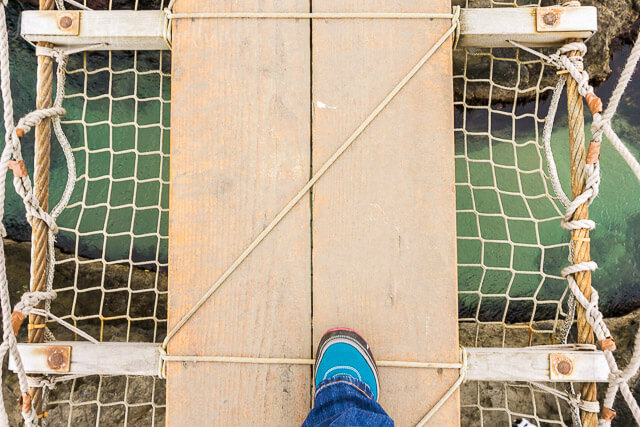 The bridge is only 65 ft long and 100 ft above the sea, not as intimidating as photos like this make it seem. 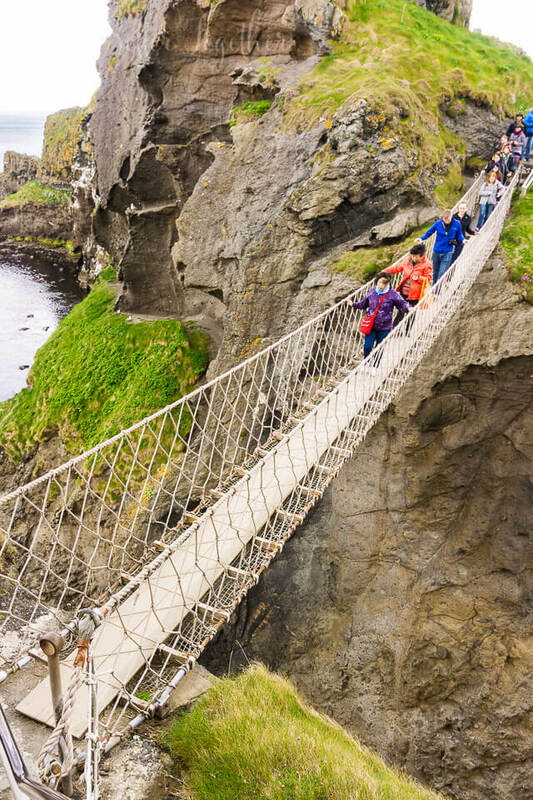 The bridge was initially built 350 years ago by fisherman as a way to Rocky Island from the mainland. From the other side of the bridge you can see the gorgeous waters and ancient caves within the cliffs. On a clear day you can see Rathlin Island and Scotland, which is actually just 12 miles across the water. I could have stared at these gorgeous waters all day, the colors were just unreal and not what you’d expect for such a northern locale. The reasoning for the Caribbean colors is due to the blooming Phytopankton and bacteria in the water as well as the white sands which emphasize the beautiful colors! We had about an hour or so at the bridge with the tour, which was plenty if you just wanted to see the bridge, but not if you wanted to do much venturing. 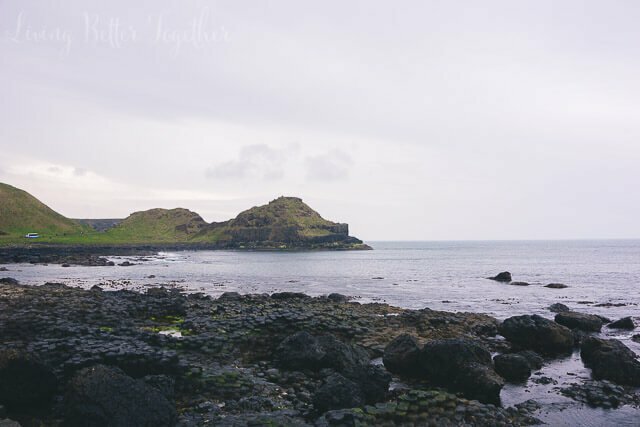 Our morning started out fairly dry, but it was beginning to sprinkle about the time with left the bridge and headed to Giant’s Causeway. Our tour guide was fantastic, he was funny and told us some great stories and history about the area. But you didn’t want to make him angry, isn’t it amazing how full grown adults can’t seem to be on time? We had this one couple in our group, who must have been in their 50s who were always late coming back to the bus even as the guide was honking and waving to them. They would just continue on to where they were going to take photos. People, I am right? 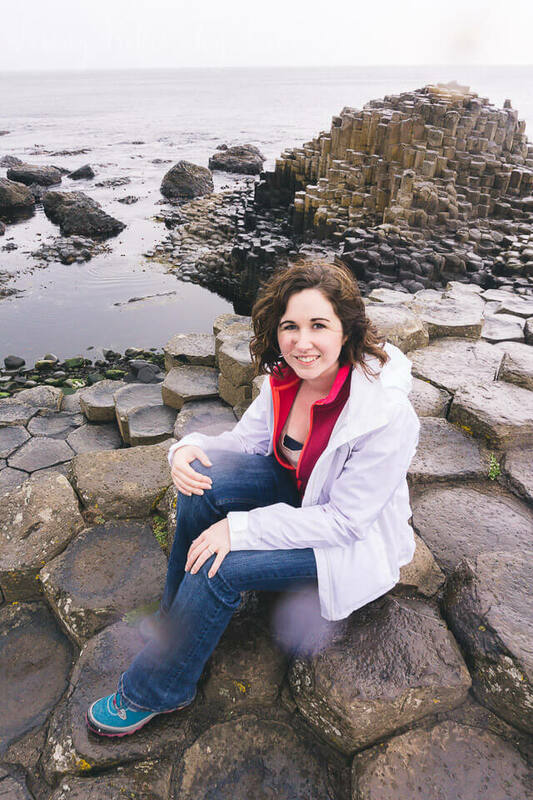 Anyways… Giant’s Causeway has been on my must see list for years! 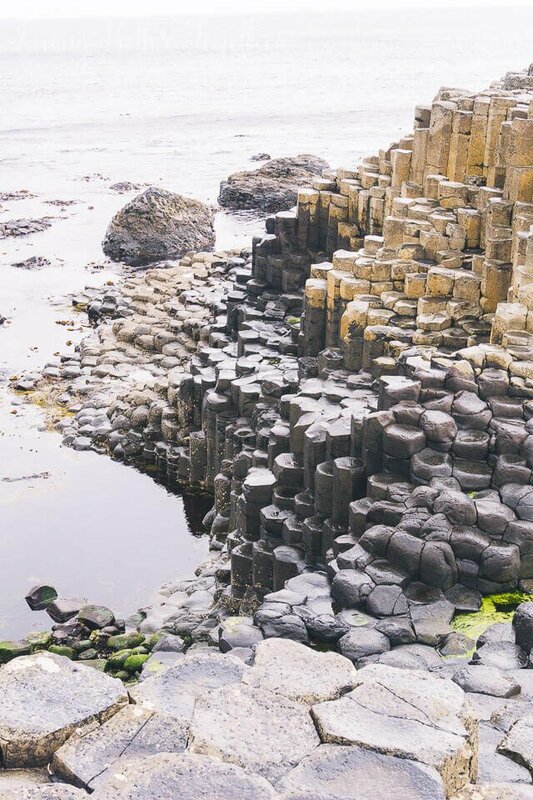 The hexagonal basalt formations from volcanic run off is just way too cool to miss! By the time we got to the Causeway, rain was starting to come down pretty good and it made the rocks extremely slippery. I would have loved to have explored them a little more, but I value both my camera and my neck, so yeah. We walked around a bit, took some pictures and made the hike back up the cliffs for some grub. 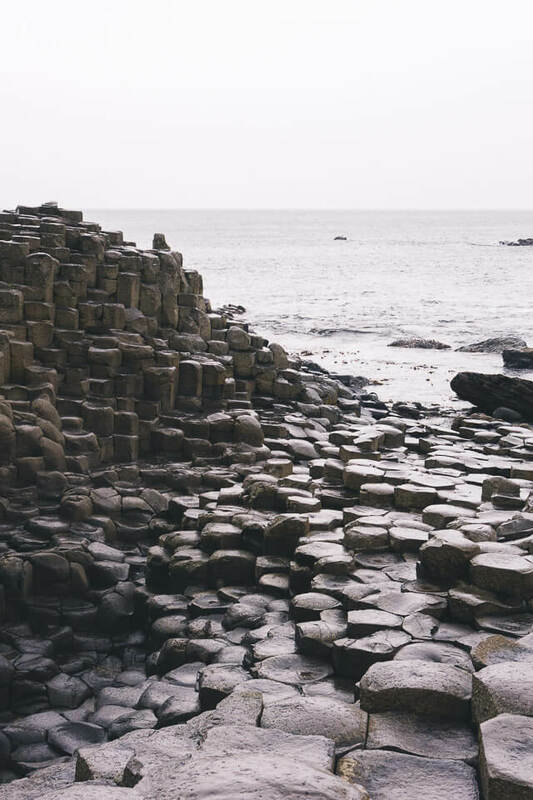 For the mythology behind Giant’s Causeway, check out the video below that was made for the visitors center. 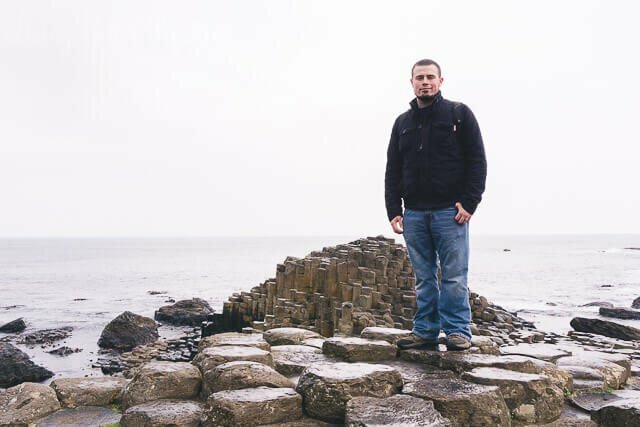 Giants Causeway Visitors Centre – The Myth of Finn McCool from The Pond Studio on Vimeo. 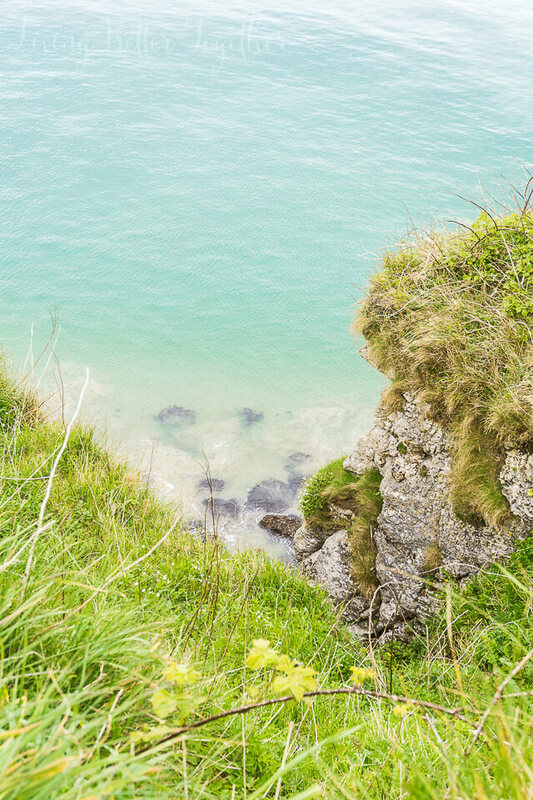 There are two places to eat at the top of the cliffs, The Nook and a restaurant within the Causeway Hotel. We ended up eating, or rather scarfing, at the hotel restaurant. We waiting almost 45 minutes for our food, having to pay the bill before we even got it so we could eat and go. They didn’t have to go packages and the food arrived 5 minutes before we had to be back on the bus. I’d love to tell you it was good, but I burnt my tongue on the first bite of my lasagna and that was the end of my taste buds for the day. Matt said it wasn’t great though and we’d recommend checking out The Nook instead. We did go in there and it smelled wonderful! 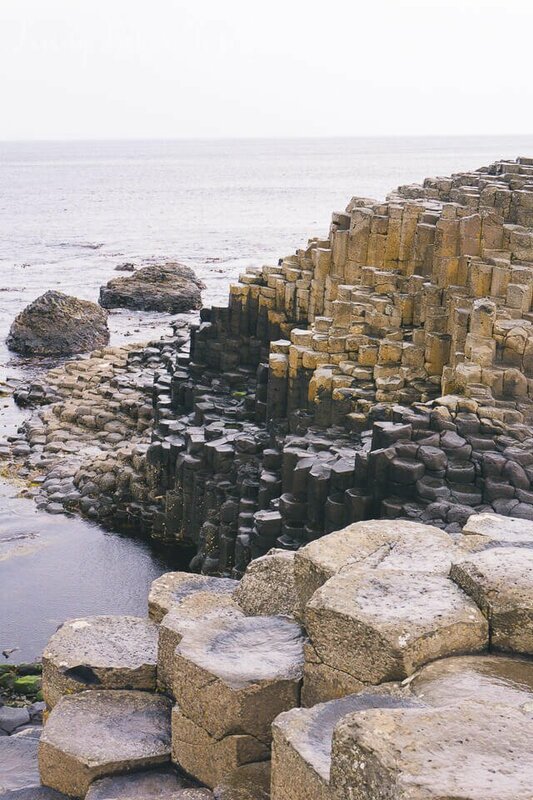 After Giant’s Causeway we were off to Belfast. At that point the rain was pouring buckets, so I didn’t get in any pictures, but it was such a beautiful city with such a sad history. We saw the Titanic Memorial, and I would have loved to have toured the Titanic Museum too. The Titanic was built in Belfast. We grabbed a pint at a pub and picked up some new books at the bookstore while we were there. The book covers in the UK were just so pretty. Then it was time for the long drive back to Dublin and Bewley’s Hotel. Some things to know about Northern Ireland: While it’s within the borders of Ireland, it is actually governed by England as park of the UK. Therefore, currency will changed from the Euro to the GB Pound when you cross the country lines. Miles will also change to kilometers on signs, so if you’re driving yourself, that’s definitely something you want to be aware of. Wow, you must have had the same grump we had for that tour. We made a stop for breakfast. I was looking for my friend and could not find her not knowing she had boarded the bus. When I went out there he jumped off the bus and yelled at me across the parking lot. Then insisted I apologize to the rest of the travelers aboard. My friend later informed him that I still was aboard before the alotted time. At the end of the tour as we got off the bus he apologized. Still did not ruin our wonderful vacation. Hahah the height of the bridge you mentioned was funny. 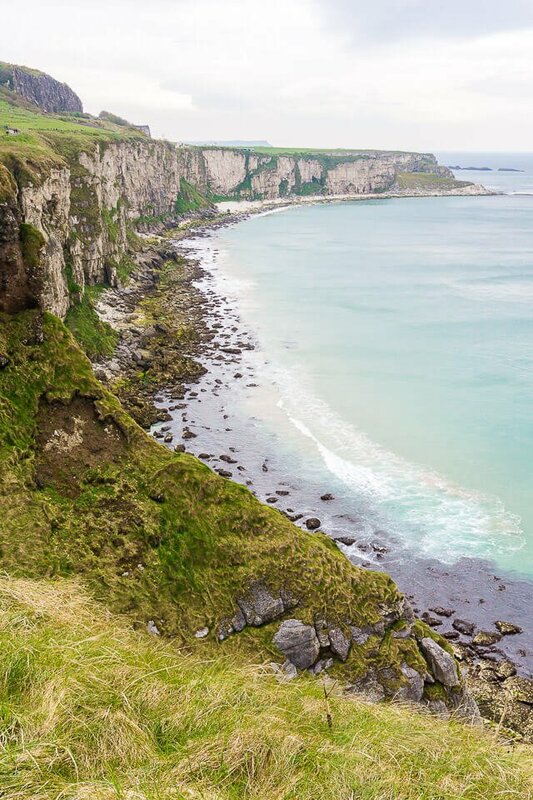 We are planning a trip to Ireland and I really thought it was going to be very high and a bit scary but I guess I can put that feeling aside. And burnt tongue .. I hate when that happens. I just burnt my tongue on hot mocha as I was searching for articles on Ireland. Thanks for this post! It was fun, lighthearted and informative!